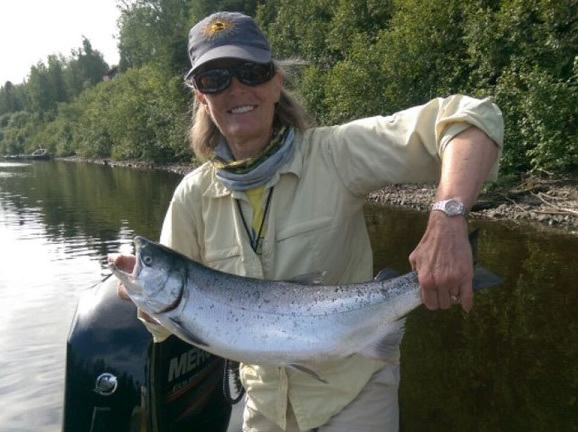 Alaska Salmon Fishing Guide! 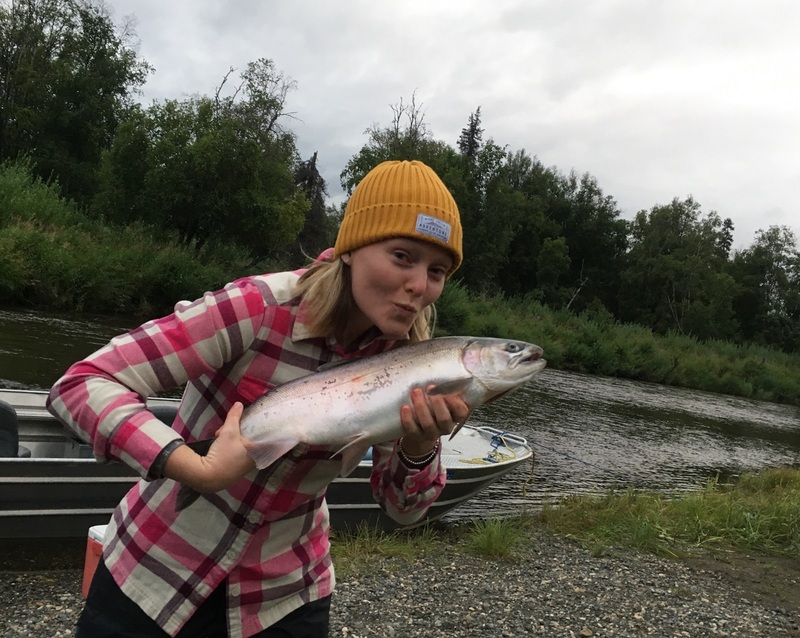 Alaska Fishing Guide! Trips! 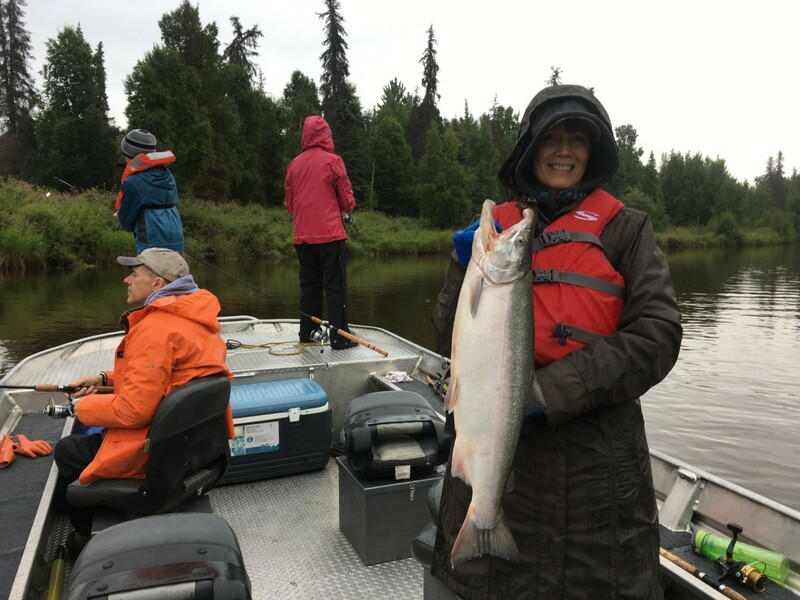 For your fully guided Alaska salmon fishing charter or trip on The Deshka River, Little Susitna River, look no further than Alaska Chinook Charters! 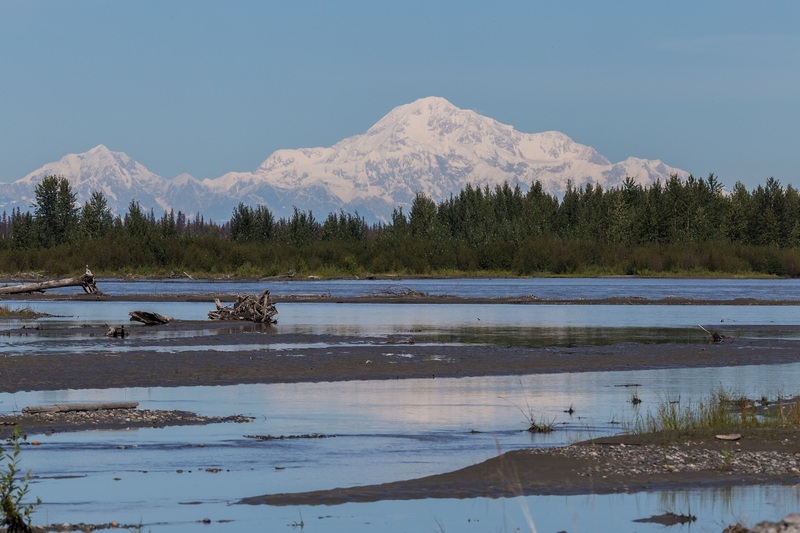 These are some of the most productive salmon fishing streams that are very close to Anchorage. 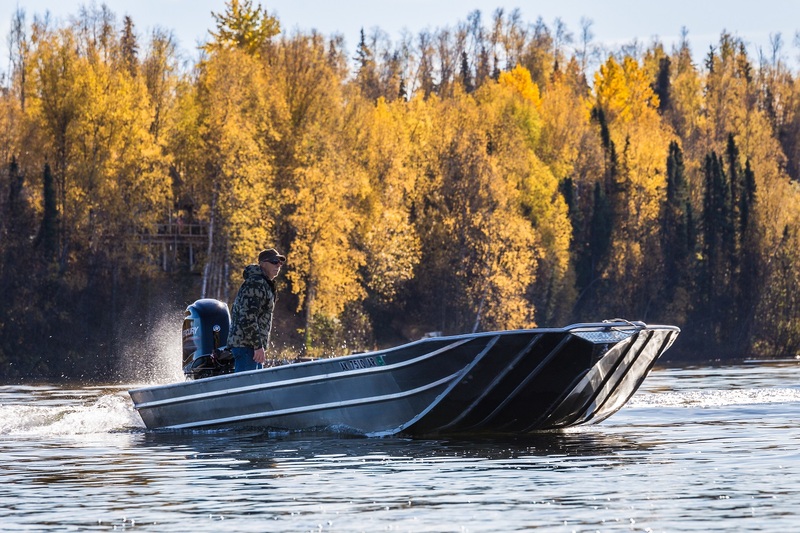 The Fishing, the wildlife, the wilderness, not to mention the jet boat ride, are all things that will create an Alaskan adventure you will never forget when you book a fishing trip with us at Alaska Chinook Charters! 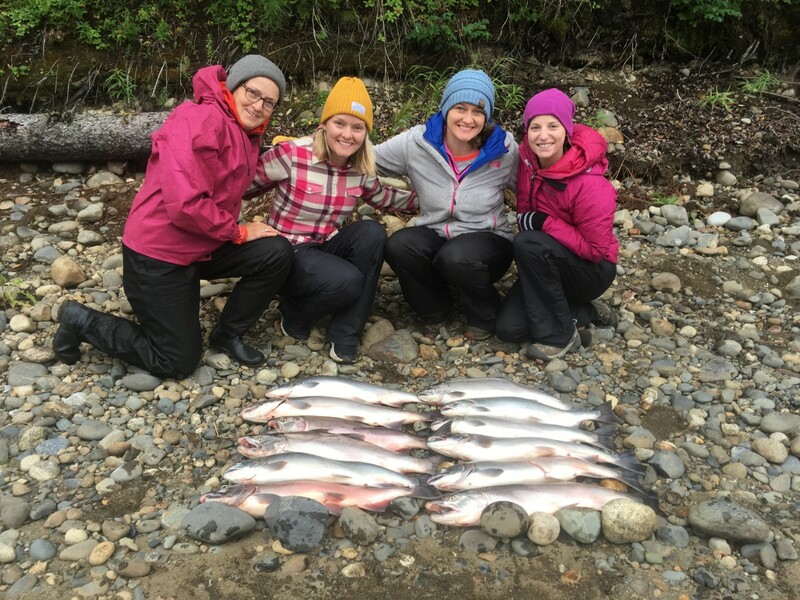 Salmon Fishing so close to Anchorage can be more affordable than you think! 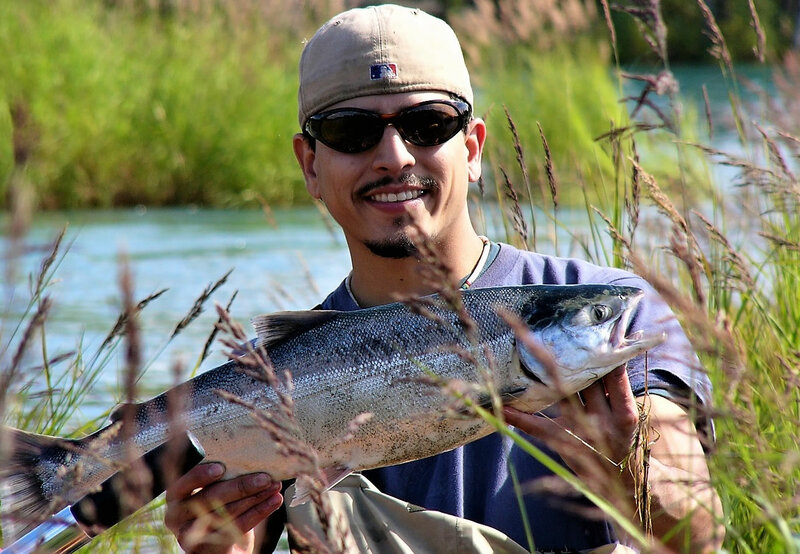 Give us a call and see how easy it is to get to where the the Salmon are; which means cost savings for you. 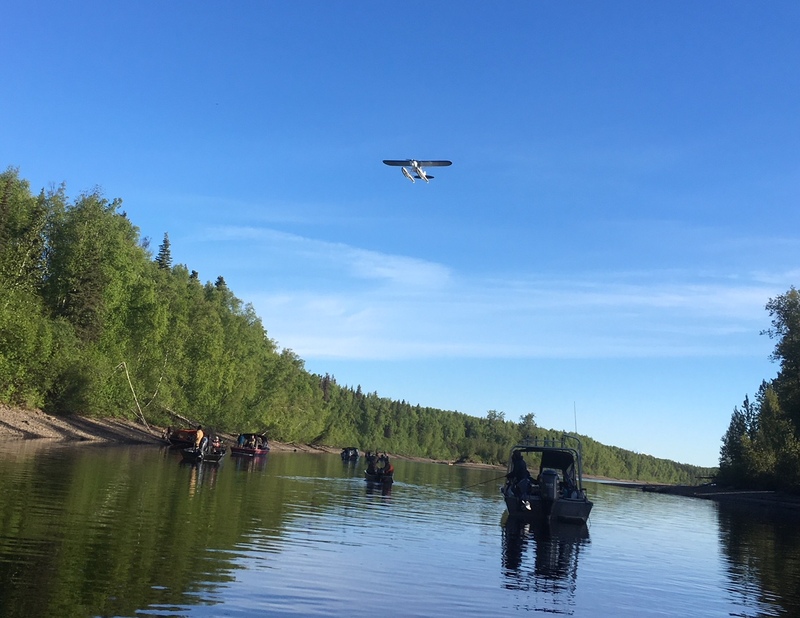 We are offering Eco Tours to folks interested in a boat excursion on the Susitna River Drainage. 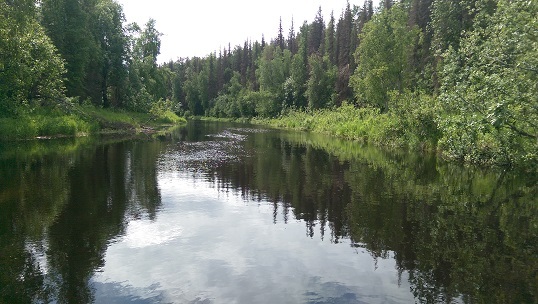 We will be targeting the local flora and fauna to include flowers, eagles, moose and beavers. 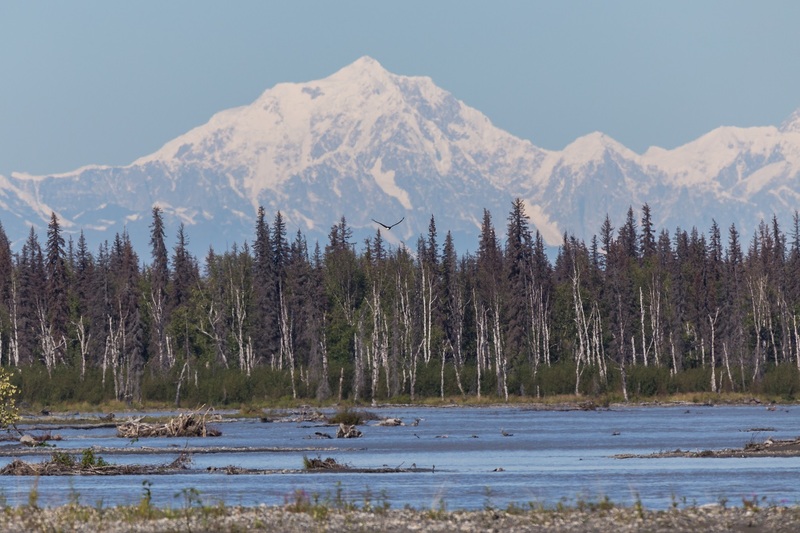 Imagine how people in bush Alaska lived and still live in remote Alaska as you travel on one of the many rivers in the Mat-Su Valley. The Eco Tour is 3 hours long; with a minimum of 2 and maximum of 4 people starting at 11:30am. 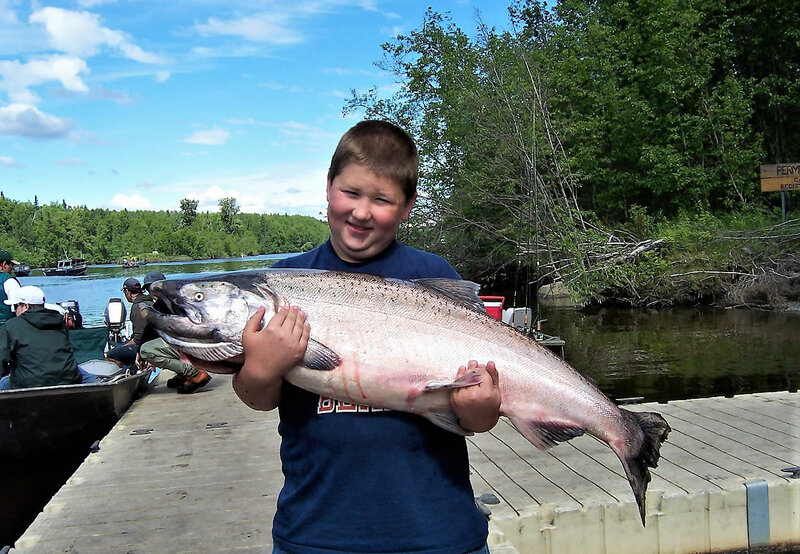 King salmon average around 15 to 30 pounds; with larger fish up to 50 pounds. 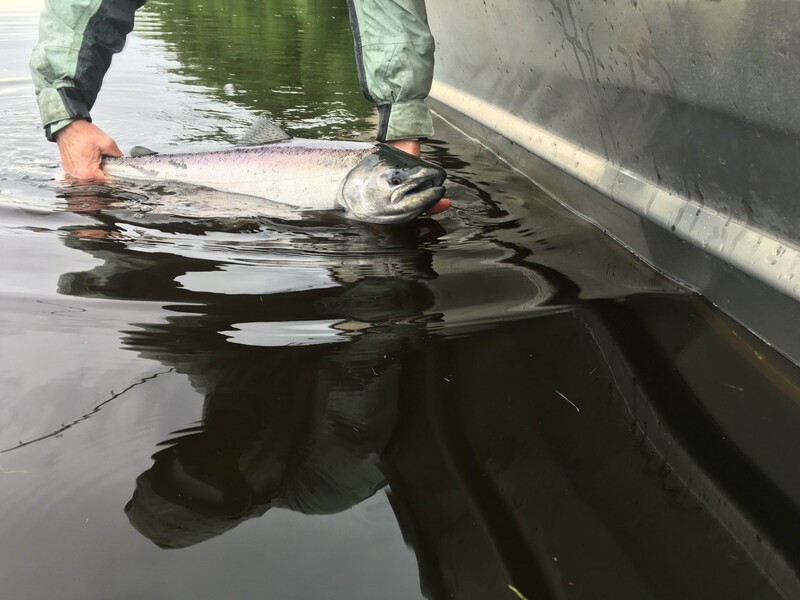 It all starts with the female king salmon returning to the original river in which she came from. She will spend 1 to 7 years out in the ocean feeding once she leaves the fresh water stream. Then she will return to the original stream. This is when she starts to die. She is there for one reason and that is drop the thousands of eggs in which she is carrying back to the stream. The male of the species will fertilize these eggs and it will start all over again. 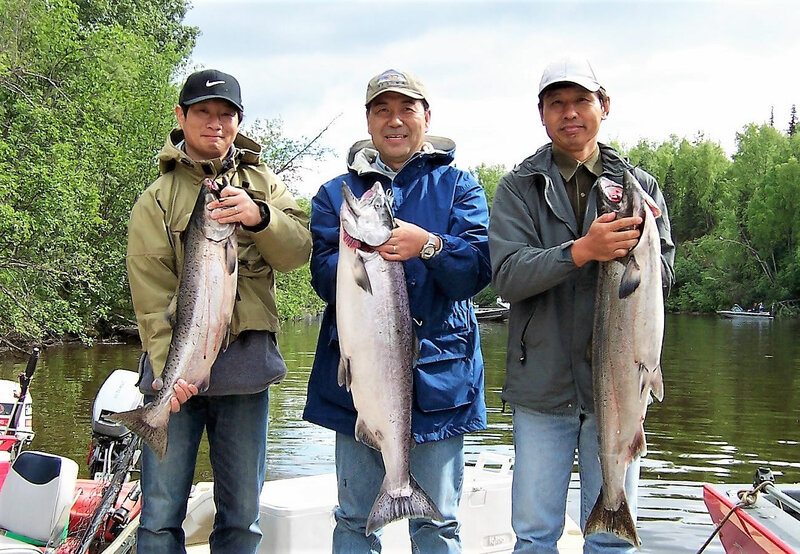 King salmon usually start to show up in the Deshka River as early as May 15th. 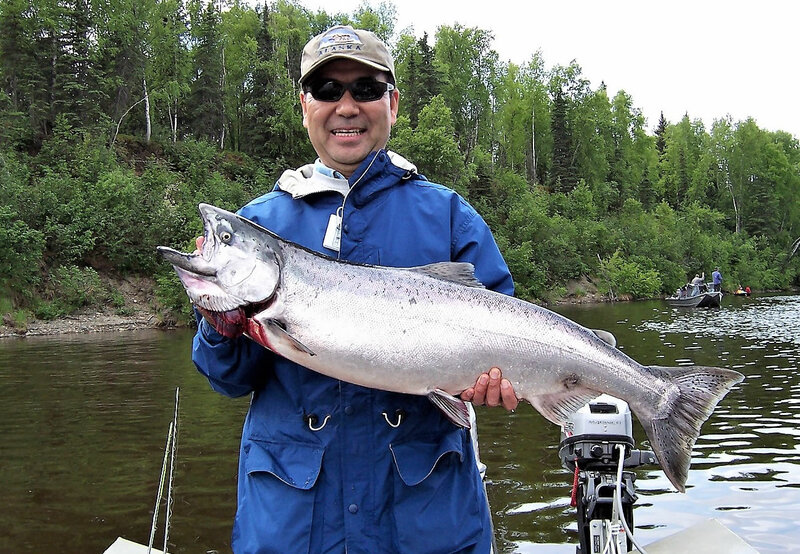 We at Alaska Chinook Charters start to fish this river around the 21st of May. As the days pass by, more and more kings show up in the river. This is why timing of booking your trip is important to you. The season closes on the 13th of July. At this time the run is starting to slow down and the quality of the meat of the kings is not as good as the peak of the season. 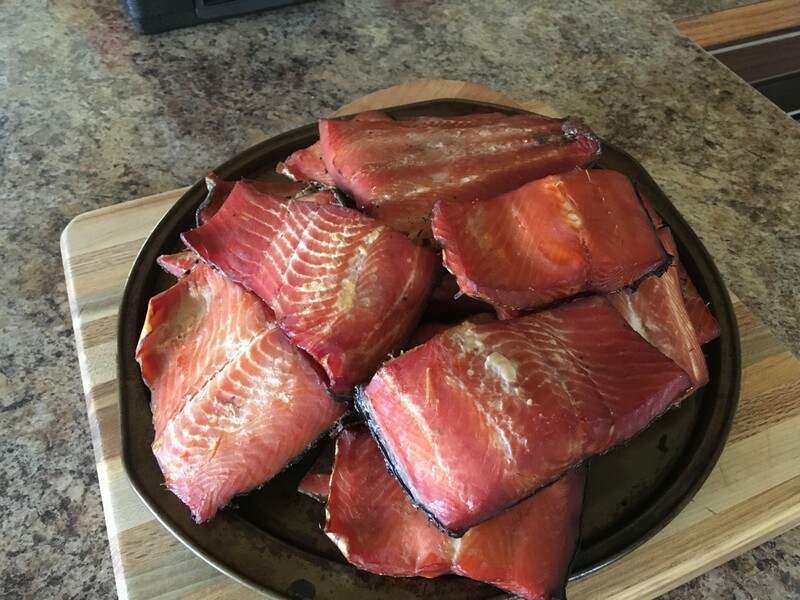 You may still catch your king but may have to sort thru a few fish to get a bright king that has quality meat. 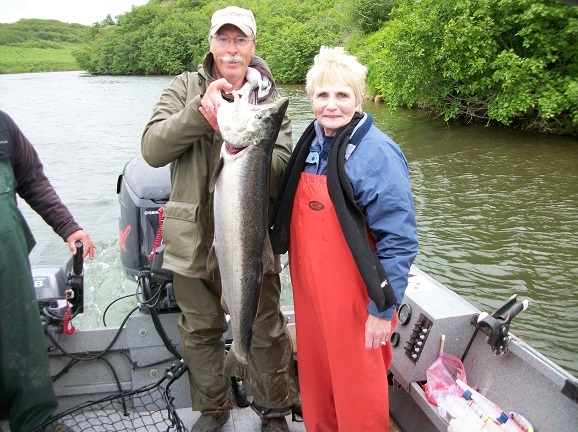 So most people will book their spots early to guarantee a bright king salmon. 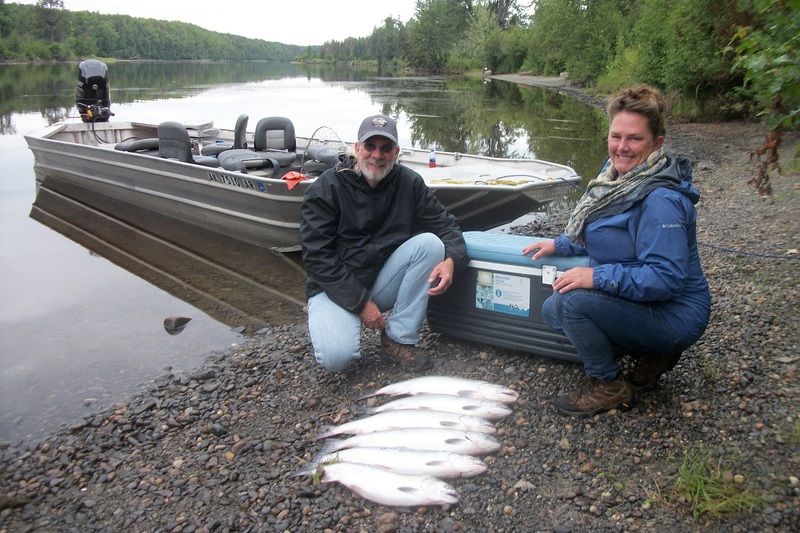 Silver salmon in Alaska usually average 8 to 12 pounds; with larger fish up to 15 pounds. It all starts with the female fry spending 1 to 3 winters in fresh water then leaving for the ocean. Some of these fish will only spend 6 months out there, and then return. Most of them will spend 18 months out in the ocean then return to the original river or stream in which they came from. 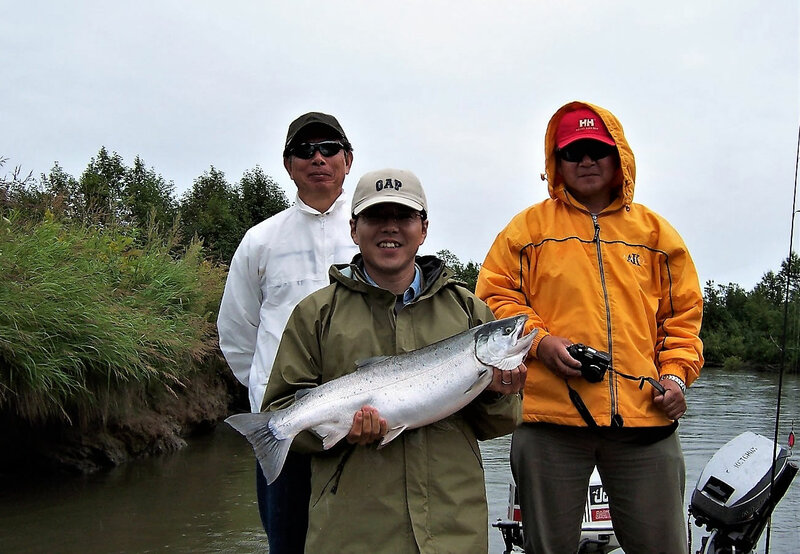 The silvers start to show up in the rivers in the Matsu-Valley area around the 21st of July. They will usually run until the end of August and sometimes into September. 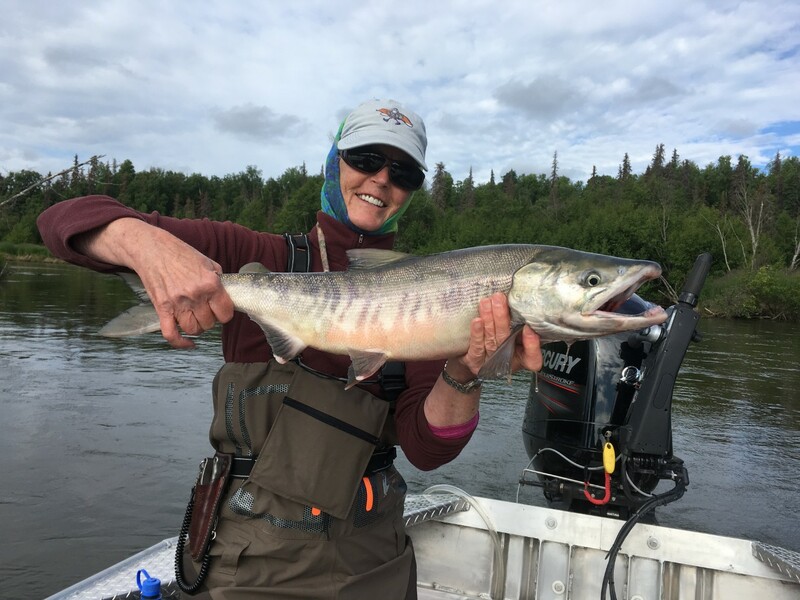 Though the Silver salmon is not the usually targeted fish in Alaska they can be a fun and exciting fish to catch so book early and get in on the fun!! 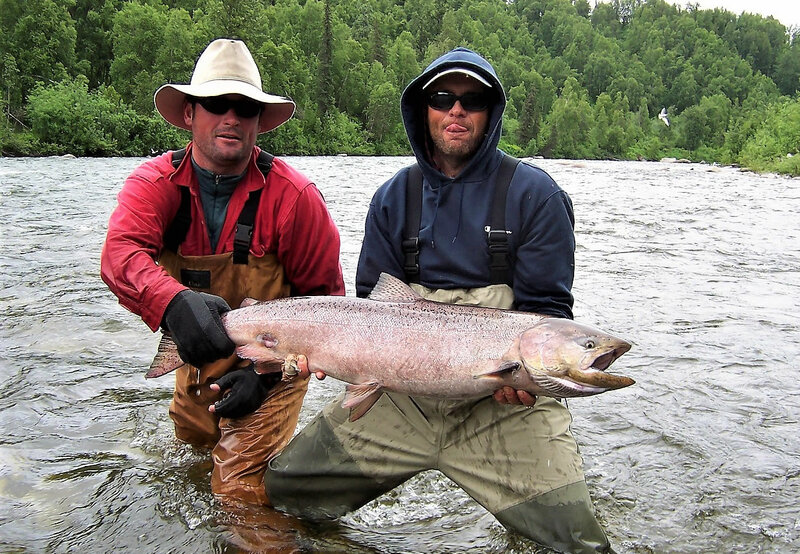 Alaska Chinook Charters offers fully guided salmon fishing and Eco Tours on the Deshka River and Little Susitna River. Both rivers are within easy reach of Anchorage. 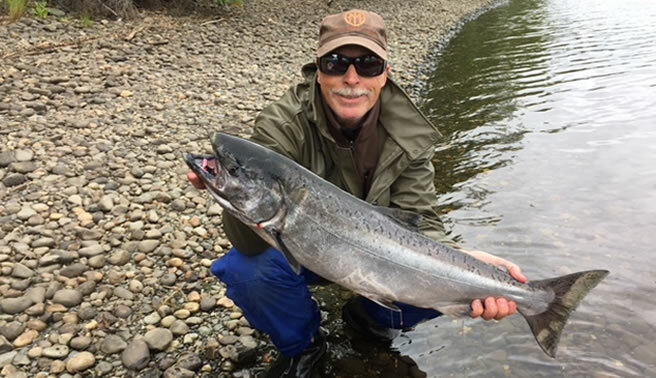 At only 90 minutes north of Anchorage, you could be fishing on one of Alaska’s most premier Chinook (king) salmon fishing rivers. 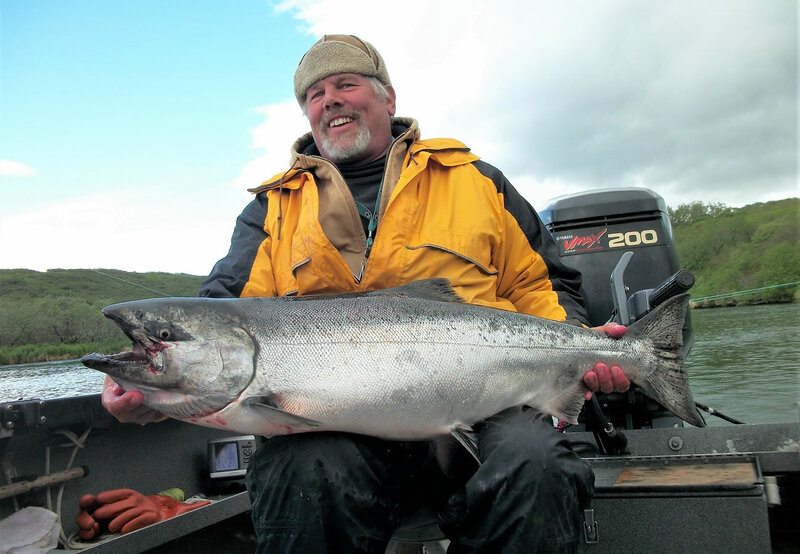 Alaska Chinook Charters has affordable trips from May 21st through Aug 25st. Half day or full day Charters available. Lodging very close to Deshka Landing can also be arranged upon request. 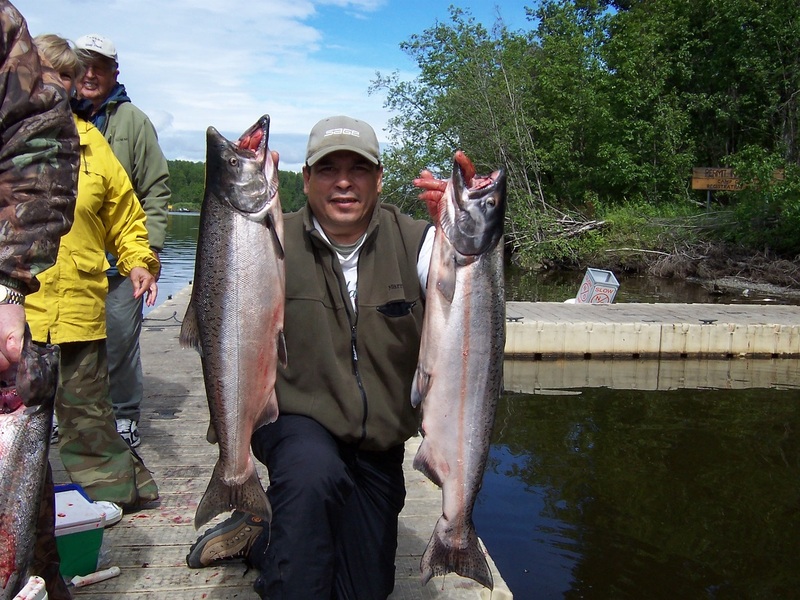 Dan Suprak has over 20 years fishing experience in the state of Alaska; guiding fishing trips for one of the state’s premier lodges on the Alaska Peninsula. Dan holds a 25 ton Master’s Coast Guard license and has a Wilderness First Responder’s Certificate. 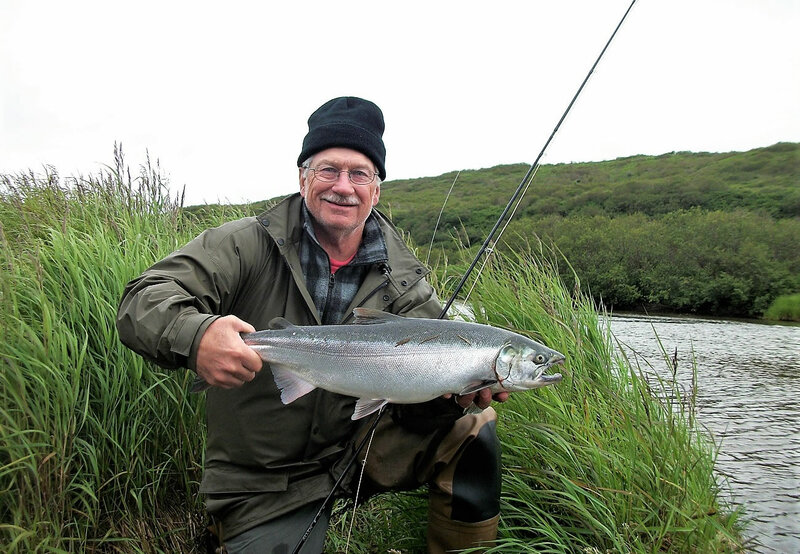 Dan is also a member of the Mat-Su Convention and Visitor’s Bureau. 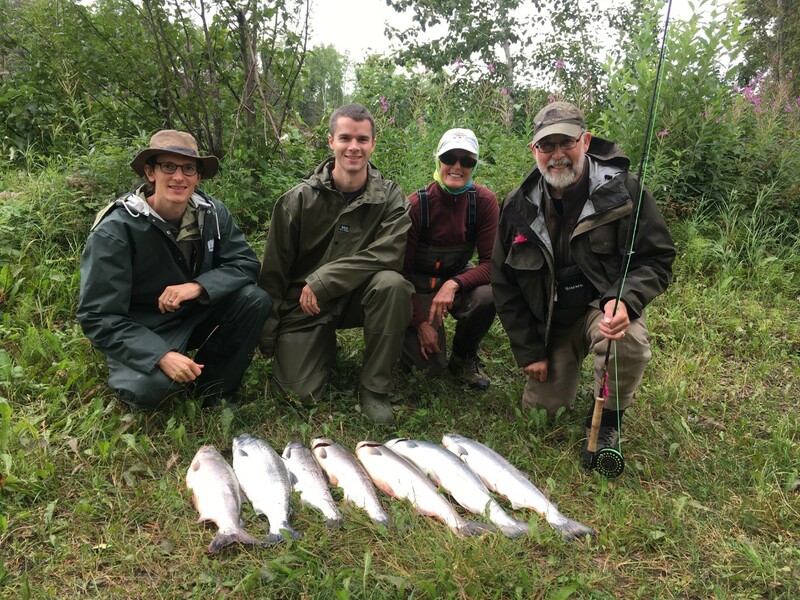 Dan is also a registered big game guide for the state of Alaska. 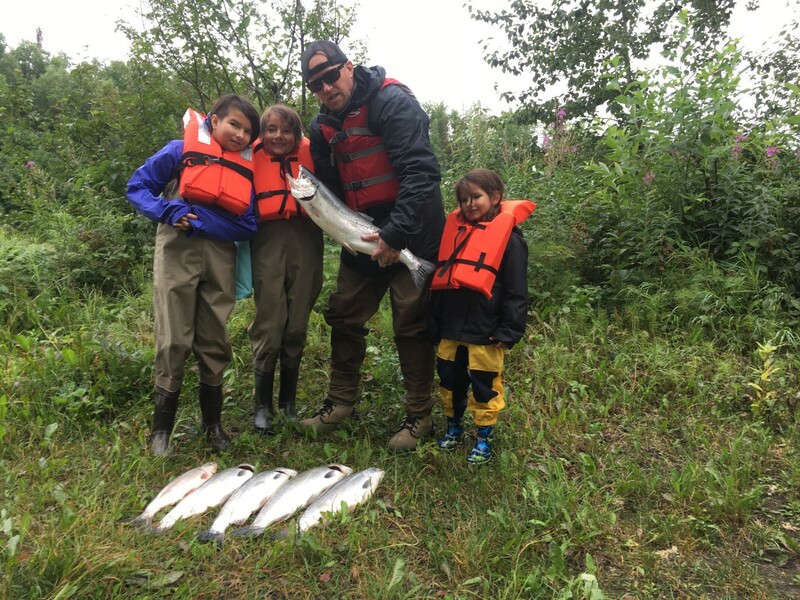 His knowledge of the wildlife seen while riding on these Alaskan rivers will bring stories of adventures from all over the state! 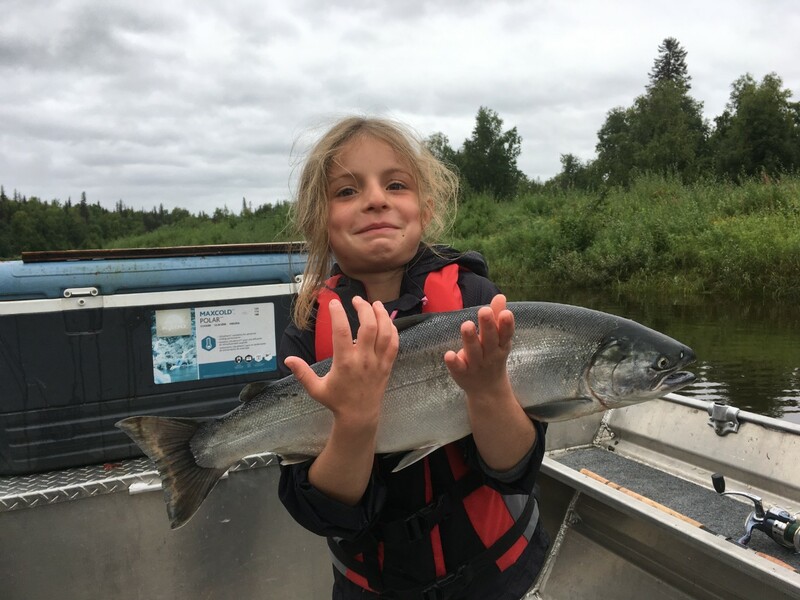 Alaska Chinook Charters shared a post.